"Rocks and Gravel" is an outtake from The Freewheelin' Bob Dylan (1963). 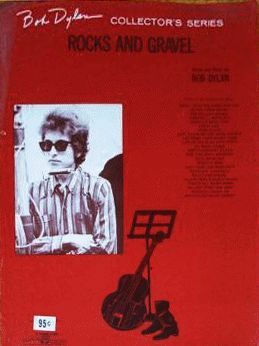 It is one of the four songs ("John Birch", "Let Me Die In My Footsteps", "Rambling Gambling Willie", "Rocks and Gravel") replaced with Dylan's newer compositions recorded in April ("Girl from the North Country", "Masters of War", "Talkin' World War III Blues", "Bob Dylan's Dream"). It was performed live on 2 July 1962, in Montreal, QC, Canada, at the Finjan Club and in New York City at the Gaslight Caf�, on 1 October 1962. It was 'officially' released in 2013 on The 50th Anniversary Collection for copyright reasons. USA, M.Witmark & Sons, New York. Part of the Bob Dylan Collector's Series.